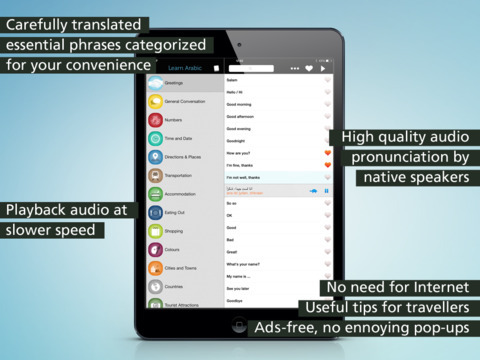 Learn Arabic is an easy to use mobile phrasebook that will give visitors to Dubai, Egypt, Algeria, Saudi Arabia, Morocco, UAE & more and those who are interested in learning Arabic a good start in the language. Learn Arabic is recorded using native speaker and we have tried our best to be authentic in the pronunciation whilst ensuring it is easy to understand. Recommended app for tourists and business people visiting Dubai, Egypt, Algeria, Saudi Arabia, Morroco, UAE, & more. • HOW TO RESTORE PURCHASES? Purchases are one-time and carry over between devices. To restore your purchases on a new device, tap on PRO badge on one of the locked categories, tap on the Restore Purchase button. Even if you forget to do this step and try to buy the app again, it will be restored for free. • WE READ EVERY E-MAIL. We're a small company, but we reply to every support request. Let us try to help at support@codegent.com and we will do our best to help in any way!